In September, Mike Patel purchased the two businesses from Othman’s family, who still own the building. After emigrating from India, Patel lived in New York City for 17 years, learning how to run a business from his family members who are also entrepreneurs, he said. Patel, 32, works an average 14 hours daily during the week and up to 18 hours on the weekends, he said, and usually starts his day with just a few hours of sleep and spending what time he can with his wife and one-year-old son. That commitment to family was important to the family said Othman’s daughter, Lina Adi. She got to meet some of Patel’s relatives who came into town for the sale. “It’s still just another family taking over, which is what we wanted,” said Adi, who did not disclose the final sale price. While Patel was living in New York, a mutual friend with the Adi family – Othman went by the name Al Adi – told him of Downtown Circle and the family’s desire to sell the business they’ve owned and operated since 2011. Until then, he wasn’t looking to move to Youngstown, but was interested in the opportunity to take over the business, he said. Patel said he is excited to be in a city that is growing, and Lina Adi said things have been going well for the past five months. “Hopefully, it just keeps going,” she said with a smile. Al Adi had been at the center of a dispute with U.S. immigration officials for more than a decade. In January 2018, he and his wife, Fidaa Musleh, were prepared to voluntarily leave the country when Adi received a stay of deportation. Less than two weeks later, he was taken into custody by Immigration and Customs Enforcement, or ICE, during what was to be a routine check-in at its office. He was deported to his native Amman, Jordan on Jan. 29, 2018. Shortly after, Musleh traveled to Jordan to be with her husband, leaving their daughter to manage the business with her aunt, Lina Adi said. Now one year after her father’s deportation, Lina Adi and her family are still working to find a way for he and her mother to return. Musleh returns as often as she can to see Adi and her younger sister, she said. Adi, who currently works at Penguin Auto Specialists in Youngstown, said she plans to stay in the area for now. While Adi had been dealing with immigration before Trump took office, ICE became more aggressive with the new administration, he wrote. Aggression evidenced by his own deportation, which Adi called a “stunt” to send a message to Americans “that they would be ruthless in the execution of their ‘policies,’ ” he wrote. In the letter, Adi thanked the support he has received from the Youngstown community, including U.S. Rep. Tim Ryan, D-13, Youngstown Mayor Tito Brown, members of city council and Tracey Winbush, former vice chairwoman of the Mahoning County Republican Party. At the end of December, Lina Adi traveled to Jordan for her wedding, she said. The family hadn’t been together since her father’s deportation. 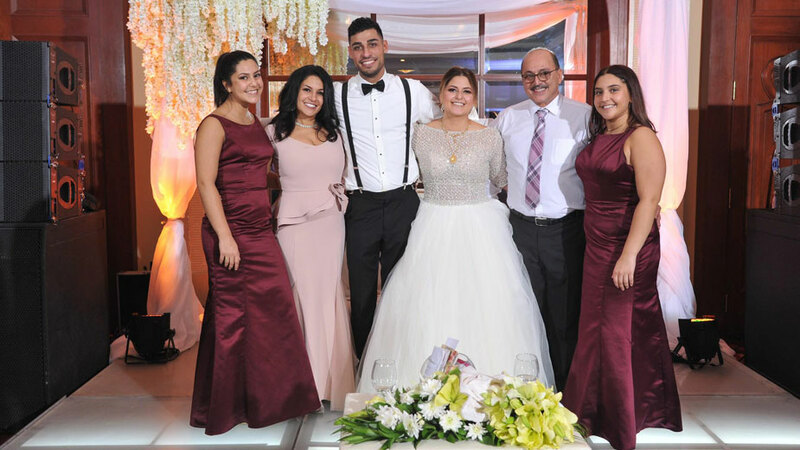 The wedding of Lina Adi (center) was the first time the Adi family had been reunited since Al Adi’s deportation. Pictured from left, Lina’s sister, Lana Adi; mother, Fidaa Musleh; husband, Nader Yousef; Amer Adi and sister, Rania Adi. And though things are difficult now with the immigration system, she is hopeful that the 2020 election will bring positive change. Until then, she will keep talking about her father’s deportation on social media to maintain awareness, she said. It’s hard to believe it has been one year since I was deported from the United States. On January 29th 2018 I was taken out of my cell early in the morning, driven from Youngstown to Cleveland, where I stayed in another cell at the ICE headquarters for 3 hours. From there they took me to the Cleveland Airport on a flight to Chicago and from Chicago to Amman, Jordan, after almost 40 years of being in the United States of America. The question that remains is why was I deported? Why did this happen to me? And why does it continue to happen to so many immigrants? I do believe it has nothing to do with upholding any system of “laws” as ICE or the Trump Administration might want us to believe. It has much more to do with the fulfillment of promises that Trump made to his constituency. He told them that he would “fix” the immigration “problem” in this country. Whenever I hear people talking about immigration as a problem, I am confused. Immigrants are what make up the United States of America. From Donald Trump himself, to his wife, to everyone who holds an American passport, somewhere down the line, your existence here in this country originated from an immigrant. Unless you are Native American. Therefore, to be against immigrants is essentially to be against what the United States really is. To be against immigrants is to be against the United States. As you read this, tens of thousands of families are being split apart due to the insane and inhumane state of immigration in this country. The news is filled with talk about this border wall, which would be built with taxpayer money, and which has no real meaning or purpose whatsoever, aside from instigating white nationalist support in the name of control for the administration. We must realize what is going on and we must do better. On a lighter note, I also want to thank everyone for the tremendous amount of support that my family and I received from the Youngstown community, from the Cleveland community and from all over the United States and the world. Finding the right words is difficult because it has meant so much to me. Big and warm thank you to Congressman Tim Ryan, to Mayor Tito Brown, to the members of City Council and to Tracey Winbush. To the hundreds and thousands of people who stood and showed their support through demonstrations in the street or by putting on events in local churches and community centers, or by speaking to the media. Especially those special letters I received from my cell. Thank you to our community for really coming together. It was really the silver lining of the nightmare. Finally, I am in Amman, Jordan right now. My life has changed tremendously since last year. Many things were lost or broken or split apart, but my wife and I are here. We’re in good shape, in good spirits, and we continue to receive a lot of support even from from here. One of the major things that happened was the wedding of my daughter Lina. Many people, family and friends, came from the US and other parts of the world to celebrate with us and we all had a fantastic reunion together. You know, not a day has gone by that I don’t think about the thousands and thousands of people in the U.S. who going through the same thing I’ve gone through. They need the support of each and every one of you now more than ever. Please don’t give up. Pictured above: Mike Patel, the new owner of Downtown Circle and Circle Hookah and Bar on Federal Plaza.